Smooth white chocolate candy bark studded with bits of crushed peppermint candy and crispy popcorn. Cover a baking pan with foil or wax paper; set aside. Place popcorn in a large bowl; set aside. Melt chocolate in a double boiler over barely simmering water, stirring until smooth, or melt according to package directions. Stir in crushed peppermints after chocolate is melted. Pour chocolate mixture over popcorn mixture and stir to coat. Spread onto prepared pan; allow to cool completely. When chocolate is cooled and set, break into chunks for serving. 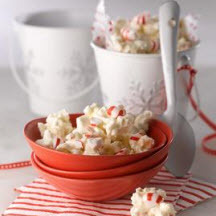 For White Chocolate Popcorn Crunch: Omit candy peppermints. Mix 1/2 cup dried sweetened cranberries and 1/2 cup toasted slivered almonds with the popcorn. Pour chocolate over the mixture after it is melted.